Despite the date, Welles’ is the more experimental of the two. Some of this may be the result of a small budget ($700,000) or a short shooting schedule (23 days). But given his history of Shakespeare adaptations with wild textual edits, I don’t think so. The film opens with the witches, of course. But they’re creating their Act Four potion. Before they do their Act One, Scene One thing, however, they pull from the cauldron with they’ve created: a clay statue of Macbeth (a pretty good caricature it is). And this statue comes back throughout the play: they put a dagger in front of it just before the “is this a dagger” speech; pouring blood over it as they chant their Act One, Scene Three story of keeping the sailor from sleeping, just before he laments his inability to sleep. Good stuff. Welles being Welles, he plays with the script, skipping scenes, having Macbeth dictate the letter to Lady Macbeth (which makes for a great transition), giving Banquo the line “the greatest is behind” and having him accuse Macbeth of playing foul for the throne. There are more movements of speeches, and placement of characters in scenes they are in in the text, like Lady Macbeth with Lady Macduff just before the murder, and later very much aware of what has happened (including Macbeth’s own participation). But damned if it doesn’t work. Welles’ Macbeth is a man manipulated: by witches, by wife, by fate. And with little impulse of his own (all reaction and no action), he moves forward with the murder even without the announcement of Malcolm as prince, and decays quickly as lack of sleep takes its toll. On the other hand, Morrissey’s Macbeth is almost all decisions (sometimes wildly vacillating). His descent into insanity is well-played. It’s a good performance, but somehow it never connected with me. Julia Ford’s Lady M is also solid, a warrior’s wife, supportive, just wanting her husband to have just a little more ambition. She, too, never connected with me, either. In fact, this is something I can say about the whole production. Don’t get me wrong: there’s some good stuff here. Fleance played by the same actor as the third witch. A truly bizarre porter. A ghost of Banquo that only appears when Macbeth sees him for the second time. 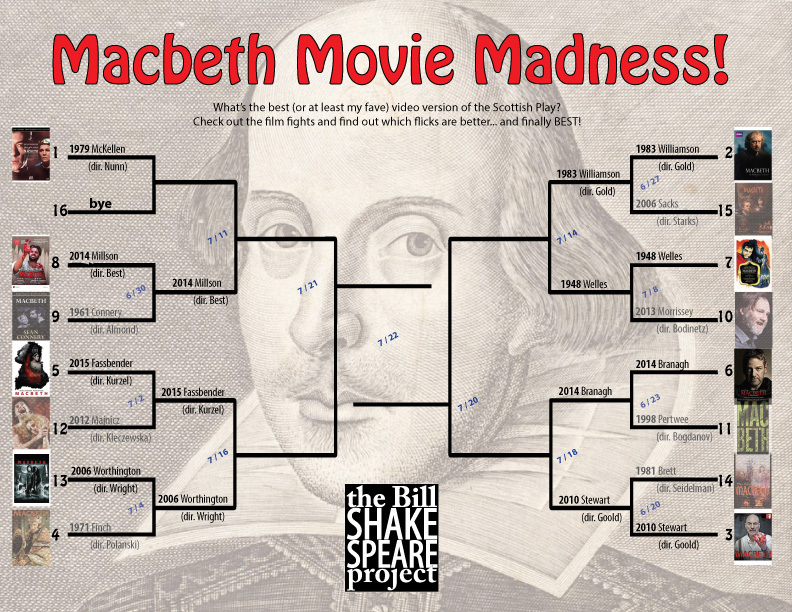 Welles moves on to the second round… to face Nicol WIlliamson from the 1983 BBC version…next week.